First things first: Pat Smith, who was an early adopter of the Whitfield DNA Project, is back with us. Feel free to email either of us with any questions you may have. As mentioned in a previous posting, hundreds of projects were up for adoption when WorldFamilies.net recently closed their website. When transferring the sites, FTDNA rolled back admin permissions to the point that we could no longer access the members' accounts. I greatly enjoy the education and analytical aspects of genetic genealogy. But in order to help, I need the ability to view testing history, matches, trees, and test results. Please review Article 50 regarding the importance of those changes and what members can do to allow their admins — Whitfield and others — to help. I've spent much of the last couple of weeks grouping Whitfield Y-STR results, drawing up cursory trees, and consulting with members. Four distinct groups have emerged from the project. What follows is a summary of what little that I've learned to date. The trees at the Whitfield Patrlineages page is meant only as an aid to track the Y-DNA from their Earliest Known Ancestors (EKAs) to our testers. They're not intended to be complete trees, and I'm reluctant to draw relationships that lack sufficient documentation. It's my hope, though, that what has been included is accurate. Please contact me should you find any errors. Because the Y chromosome is passed from father to son unaltered, genealogical myths are often uncovered through DNA testing. For some testers, that's not terribly satisfying. However, the truth is often more exciting than the myth — even if difficult at times to ascertain. (This is not to say that I've uncovered any startling myths among the Whitfields!) As we'll see, DNA evidence, especially the Y, is a powerful document written into the very core of each of our cells. Unraveling these microscopic strands can amount to a revealing and, for some of us, a life-altering journey. The Y-DNA for the Group 01 Whitfields and the CF01 Cooleys (my brand) are bound to one another about as tightly as two entangled quantum particles. Both Y-STR and Y-SNP testing have shown that John Cooley (c1738-1811) of Stokes County, North Carolina and William Whitfield (1751-1835) of Goochland County, Virginia carried virtually the same Y chromosome, which we now know as R1a-YP4491. Because I've written about this extensively already, I'll leave it pretty much at that.1 For now, it's sufficient to say that I suspect the two men share a paternal ancestor who lived no more than about three generations earlier. Except for one of the collateral lineages ("Old CF01" below), it's likely we've gleaned about as much from the Y-DNA as possible, at least until ever more advanced testing arrives. In the meantime, old-school genealogy might be the new wave. 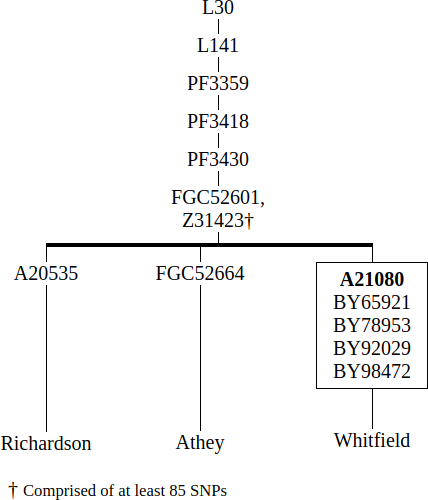 Advanced SNP testing for these Whitfields — testing which looks for a simple mutation at a single, one-letter position — strongly suggests that the patrilineal ancestors (one father before the next) are of a Norse-Scottish group, possibly of the Viking era.2 Some genealogists believe the early Cochrans were Norman, which makes genetic sense since Normandy was settled by Vikings. Eventually, further collateral SNP testing, dovetailed with the historic, archaeological, and genealogical record, will point to the most likely origin. In the meantime, the Whitfields, Cooleys, et al, should cling to the coattails of the better known Cochrans. Group 02 is interesting on a number of levels. First, it includes two interesting figures: George Whitefield (1714-1770), the famous Anglican cleric who became one of the founders of the Methodist Church and toured extensively in the American Colonies, and John Frederick Whitfield (c1750-1819), a London actor who flourished just after Whitefield's death. George Whitefield appears to have no living descendants, but his older brother, Richard, dis sire what was to become a fairly large population of men who carry his Y chromosome. Assuming the lineage is correct — and there's no reason to believe otherwise — it's via Richard that we know the reverend's Y-DNA. The fact that it matches to the descendants of actor John confirms the belief that they were cousins. However, the published lineages I've seen so far that link them to one another are not convincing. I would be happy to receive any insight regarding that. Haplogroup G2a-Z31423 (aka G2a-FGC52601), the Whitfield-Athey parent haplogroup, is presently a block of 85 SNPs.3 Because one SNP mutation will come along roughly every three to five generations, or about once every 144 years, this set may have taken 12,000 years to emerge!4 Of course, mutations don't happen like clockwork. Pretty much anything can happen, although I suspect not 85-plus mutations on the Y chromosome at one birth. Anyway we cut it, there are a large number of yet-to-be-discovered branches hidden in this tree. My question is, How did haplogroup G get to Britain? We have a theory about the R1a haplogroup of Group 01, also rare in Western Europe. It makes sense. Viking artifacts, including DNA, are found from Iceland to the heartland of Russia.5 If there's a similar theory about G (perhaps Roman warriors imported from the steppes? ), I'm not aware of it. But that the haplogroup is rare in Europe helps us understand the long break in the genetic record. After all, the vast majority of DNA testers are of Western European descent, and most of them are R1b. Well-known genetic genealogist, Whit Athey, is working closely with the members of this subclade.6 He should be made aware of any further advanced SNP testing from Group 02. Although Group 03 is historically significant in the U.S., none of the group has yet ordered advanced SNP testing nor, it seems, has any of the group's non-Whitfield matches. Haplogroup I-M223 (ISOGG designation of I2a2a), well-represented in Europe and possibly Germanic in origin, is somewhere in the neighborhood of 15,000 years old. A SNP tree of any kind will not be very representative. Furthermore, I'm unaware of the genealogical tie between the testers in this group. To fill this space, here are some notes about descendants of William Whitfield of Nansemond, Virginia, believed to have been a son of Matthew Whitfield and Priscilla Lawrence, of whom I presently know nothing. William Whitfield I is considered to be the founder of this American family. Thought to have been born in Lancashire of unknown date (but probably before 1700 judging from the birth dates of his children), he and his wife, Elizabeth Goodman, are said to have been killed in 1770 by Tuscarora Indians. He was the father of William Whitfield II, a captain in the 6th Virginia Regiment during the American Revolution, and grandfather of William Whitfield III, a justice of the peace in Dobbs County, North Carolina and father of 29 children by means of four wives. William I's descendants include James Whitfield (1791-1875), a governor of Mississippi; Henry Lewis Whitfield (1868-1927), another Mississippi governor; and North Carolina congressman Benjamin F Grady (1831-1914). There are certain to be any number of interesting stories to be told about this family, but it needs also be noted that the early Whitfields were prominent slave holders. This group, for which we have only two testers, is of the dominant Western European haplogroup R1b. There are more Western European men descended from this population than any other. Despite that, and like our other Whitfield groups, these family also has a slender Y-DNA thread. Only the two participants match one another at 37 markers, a rather remarkable feat (for lack of a better word). R1b-P312, the most recently-known SNP the group has tested for, is a major R1b subclade and is estimated to be about 4500 years. But with no matching Y-STRs and no advanced SNP testing, we have no evidence about the family's pre-history. What I presently know about its genealogy is equally sparse. See the Whitfield Patrlineages page for that. The Whitfield-Athey group is highly fascinating and potentially rich in new findings. And that there are no more than five Y-SNPs that separate the Whitfields from the Atheys is encouraging (see the first graphic, above). The break in the lineage might have occurred as little as little 700 years ago — eons by some perspectives but potentially within the genealogical timeframe. The immediate question in regards to Group 02 is, Of those five SNPs, which are shared among the other group members? A Big Y test by another descendant of actor John would tell us just which of those came from him directly, providing a unique Y-DNA print for John, one that he would have shared with only his close male relatives. In other words, one or two of the new SNPs likely came into the lineage at a later date, possibly even with the tester's own birth. These SNPs just might be parsable into a tree all its own. But it doesn't require a Big Y to gain some understanding about the SNPs' distribution among the Group 02 population. SNPs can be tested individually at Yseq.net for $18 each — only $90 for all five. Furthermore, I recommend that all Group 02 Whitfields join the G-PF3359 Y-DNA Project and fully participate in that line of genetic inquiry. Perhaps not many fellow Whitfields would understand or appreciate it, but populations geneticists, academics, and geeks working on haplogroup G would find it beneficial to their research. Yseq has been tremendous for the Cooley DNA project, including the CF01 group, the apparent clone of our Group 01. 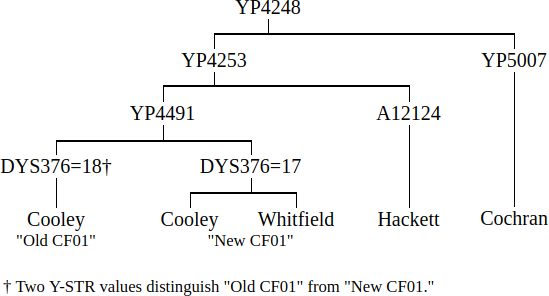 There are only four SNPs in the YP4491 subclade but the "Old CF01" branch has not tested for new SNPs.7 Should a defining SNP be found for that branch, we stand to learn something about when the split between the Cooleys and Whitfields occurred. Otherwise, the SNP lineage is pretty well forged; we need to go back all the way to R1a-M417, more than 6,000 years ago, to find a haplogroup that has more than just a handful of SNPs — nothing like the mightily unconquered Z31423 block of SNPs Group 02 has to tackle. The I-M223 Y-Haplogroup Project is large and active. Group 03 Whitfields should join it and consider following any recommendation made by the project leaders. Broader participation by current and new members can unlock the lineage back to Lancashire and beyond. I'm always happy to make testing recommendations and always pleased to answer questions. As I said at the top, the Whitfield Patrilineage page is not intended to be anything nearing a complete genealogy, but I want it to be accurate. I'm interested in well-documented lineages that suggest the origins of the Whitfield groups. There are, of course, more than four Whitfield families.8 Only those discussed here have two or more matching testers. If there's any one truth to be learned through the current state of this project, it's that the Whitfields are about as diverse as any other British surname — other than Smith, Jones, and a few others, of course — in that it has origins from haplogroups G, I, R1b and R1a — all of which diverged from one another tens of thousands of years ago. We cannot point to one Whitfield origin but to many. The name might have Dutch origins as discussed on various webpages, but for others it could have originated from a person who lived near a field of white cow parsley, or from someone who was a tenant at Whitfield manor in Northumberland during the Middle Ages. The fun is in finding it out. I resisted the temptation to design this article as a DNA tutorial, as I largely did with my introduction to The Ashenhurst DNA Project. The names may be different but the concepts and procedures are the same. Feel free to explore my other articles via the link at top. 1 The articles are most easily found by going to the blog contents and doing a browser search for CF01. 2 Current aging estimates at YFull.com push the "birth" of YP4258, the great-grand-daddy of the Cochrans, back to about 500 A.D.
3 It's been remarked that each person is born with an average of 60 mutations across their entire genome, which is made of more than three billion pairs of nucleotides or genetic letters. 4 Dr Whit Athey suspects the gap might be, in fact, up to 120 SNPs, which, to use an overly-used word, is truly awesome. 5 It's essential to understand that not all Vikings were R1a. Like all populations, they were a mixed bag. There were other routes that R1a, the most numerous Y haplogroup in Eastern Europe, took on its route west. 6 Whit is the founder and past editor of the Journal of Genetic Genealogy and developer of the community's first haplogroup predictor. 7 FTDNA's Big Y test looks at more than ten million locations on the Y chromosome and invariably discovers previously unobserved mutations. 8 I've just learned that the father of Robert Lawson Whitfield (1831-1877), one of the unmatched R1b families, was a Bedgood.